The Town of Aurora is a growing community with over 1,300 businesses, including approximately 150 major industries and head offices. A strong entrepreneurial community is located within the town. Aurora's has continued to grow recently with the opening of the corporate head office of State Farm Insurance and the Hallgrove Business Park. The town is committed to economic growth with a ready supply of employment lands and a new premier Business Park in the Leslie Street and Highway 404 area. The advantages of doing business in Aurora are numerous. Established and developing employment parks are connected by efficient regional rail, transit and road systems. The historic downtown core on Yonge Street is supplemented by a wide variety of retail outlets and office centres. 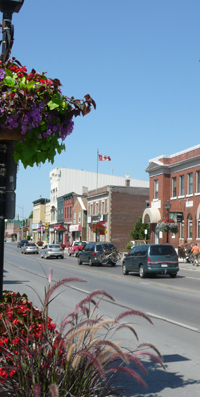 Aurora's location offers all the advantages of an urban centre while maintaining its small town atmosphere. Portions of the Town exist within the environmentally-significant Oak Ridges Moraine, which provides rolling terrain, rich valley land and large forest tracts. There are outstanding opportunities for business growth with an active Chamber of Commerce and a supportive, cooperative municipal government. Aurora is a scenic and friendly Town with a rich cultural heritage, recreational facilities and neighbourhoods. An ideal place to live and grow a business. To download our full Community Profile document, please click here, or view selected quick facts below.